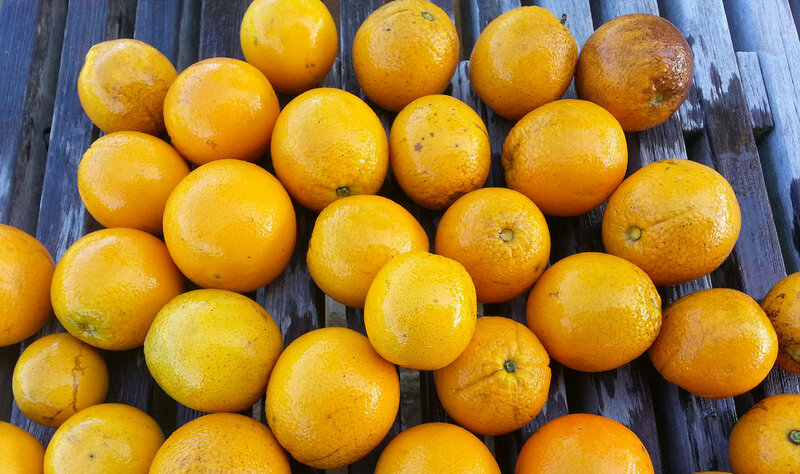 On a hot summer day when you’re craving juicy oranges, tangy lemonade and meaty avocados, look no further than Lokoea Farms, a family-run fruit farm tucked along the outskirts of Haleiwa. Since 2000, farm owners Noe Neumann and her father Donald have mastered the art of growing trees that bear mouth-watering citrus, mangoes, bananas, avocados and more. Noe moved back home in 2015 after living on the mainland for eight years to help turn her family farm into a profitable business. Upon her return, she enrolled in GoFarm Hawaii, a farmer-training program offered by the University of Hawaii, where she learned the ins and outs of running a farm in a sustainable manner while still generating revenue. However, even with in-depth training with GoFarm, Noe shares that every day is still a new learning experience. From battling soil that is too rich in clay (which affects how the soil holds water) to learning the different temperamental personalities of each tree variety, a full schedule is almost guaranteed. For more information or to learn how you can purchase fruits from Lokoea Farms, visit www.lokoeafarms.org.